Family History Society of Cheshire - A Visit to The John Rylands Library on Deansgate, Manchester. A Visit to The John Rylands Library on Deansgate, Manchester. 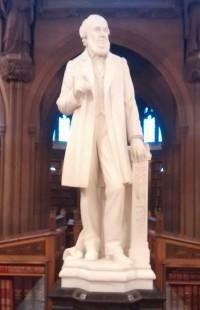 John Rylands(1801-1888) was an entrepreneur and philanthropist. He owned the largest textile manufacturing concern in the UK and was Manchester's first multi-millionaire. In memory of her husband, Enriqueta Rylands founded The John Rylands Library. Enriqueta negotiated and purchased the 2nd Earl Spencer's library and further collections of manuscripts. The library was inaugurated on 6th October 1899, the anniversary of her marriage. On the same day, she was admitted to the Freedom of the City of Manchester, the first woman to receive this honour. The library opened to readers and visitors on 1st January 1900.